Key to a smooth business ownership transfer. From the outside looking in, it may appear that transferring a business (through a sale to an outside party or succeeding control/ownership to an employee and/or family member) is an easy, if bureaucratic, process. But the tiniest of scratches to the surface reveals all sorts of issues that require careful consideration; not the least of which is maintaining the success and profitability of the business throughout the ownership transition. Whether your business is family-owned, sole-proprietorship, partnership, franchise, LLC, or corporation, there are some sound practices and approaches common to all types of organizations considering an ownership transfer. Like so many things in the world of financial management, business owners need plenty of time to make this transition. The continuity and success of the business is sometimes sacrificed if an ownership transfer occurs suddenly or due to a crisis. The entire process becomes more difficult under rushed time constraints. Open communication about the succession process and plans with employees and family members actually builds trust and security. 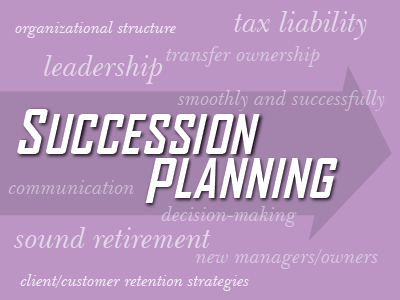 By informing business stakeholders about succession planning, the owner is demonstrating thoughtfulness and transparency. No one likes surprises when it comes to the future of their jobs and income, so discussing the ownership transfer can be very reassuring. There is no need to divulge private or financial details – only a requirement to let stakeholders know about your plans and timeline. The ownership transfer is literally all about plans, plans, plans. Experts recommend preparation of a strategic plan, estate plan, succession plan, and a business valuation report as critical components of this process. Realizing that the actual ownership transition will take years (some estimate three to six years) it’s a good idea to seek guidance from professionals that are familiar with your specific business enterprise, such as legal specialists, accountants, financial advisors. financially and personally prepare the new owners and managers to take over the business. Prior to permanently exiting the business, it is very helpful to the new managers/owners to “practice” running the organization in your absence. Plan to try to take trips away from your company so that the new managers and owners can try on leadership and decision-making independently. Part of completing detailed succession planning is identifying a date of departure. It may be difficult to really let go – but it can be detrimental to the business and new owners for you to only "semi-retire". It is best if you pick a date – and stick to it, although it will be a big adjustment for you. These tips and sound practices are common for helping any business transfer ownership smoothly and successfully. However, the type of business you own, the organizational structure of it, your preferred choice of a new owner, and the method of transfer are all unique, and have distinct legal, estate, and tax implications that must be addressed accurately and thoroughly. And if it’s a family-owned business, these considerations potentially become more complex and sensitive. Heidi Clute, CFP® of Clute Wealth Management in South Burlington, VT and Plattsburgh, NY, an independent firm and registered investment advisor that provides strategic financial and investment planning for individuals and small businesses in the Champlain Valley region of New York and Vermont. Clute Wealth Management and LPL are separate entities. The opinions voiced in this material are for general information only and not intended to provide specific advice or recommendations. LPL Financial does not offer legal or tax advice.